The Mitel 5340e IP Phone delivers easy- to-use, one-touch access to many phone features and applications in an exciting next generation desktop device. The MiVoice 5340e can be customized to a specific user's needs or used by any general employee in a business. 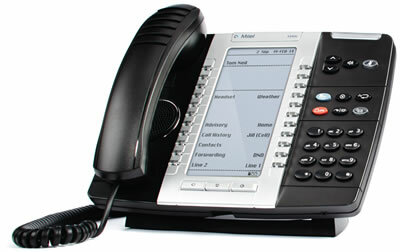 A full-feature enterprise-class telephone, the Mitel 5340e IP Phone provides a large backlit graphics display with 48 programmable self-labeling keys, six intuitive call state sensitive softkeys, superior sound quality with wideband audio, and a built-in HTML toolkit for desktop applications development. The MiVoice 5340e IP Phone is ideal for any enterprise executive or manager, Hot Desk users, Teleworkers, and Contact Center agents and supervisors. Accepts standards-based (IEEE 802.3af) power over the LAN and supports 48VDC Ethernet / AC power wall adapters. Can be powered via a powered switch or by local 48V Ethernet power. Every Mitel MiVoice 5340e IP phone from Telephone Magic comes with a full 1-year warranty.